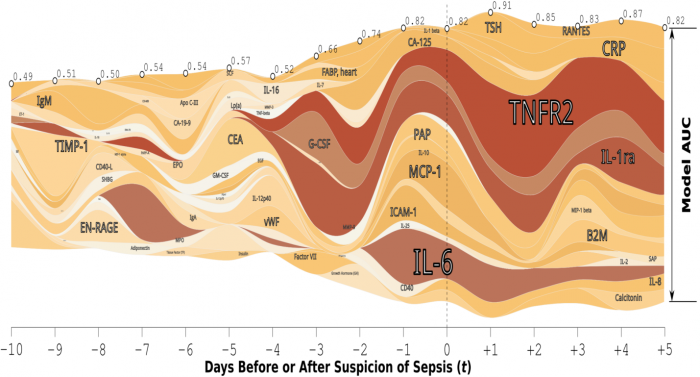 The goal of this study is the identification of a set of protein biomarkers for rapidly and reliably detecting late onset sepsis. We have enrolled 139 infants over a five year period and performed a focused proteomic assay of 90 potential biomarkers in collaboration with Rule based medicine (RBM). The project is funded by a Thrasher foundation grant with Dr. Ohls as PI. *This figure depicts a streamgraph representation of the predictive capability of the various proteomic biomarkers at different time points. Time 0 denotes the day of blood draw for sepsis.